Burgas University “Prof. Dr. Assen Zlatarov“. One of the objectives specified in the contract for the creation of the consortium is the universities to participate in partnership with a project proposal under the Operational Programme "Science and education for smart growth" 2014-2020, Priority 1 "Research and technological development "procedure BG05M20P001-1.001" Establishment and development of centres of excellence "Component 2" Informatics and information and communication technologies ". The title of the project is “Universities for Science, Informatics and Technologies in the e-Society and the acronym of the project is UNITe. 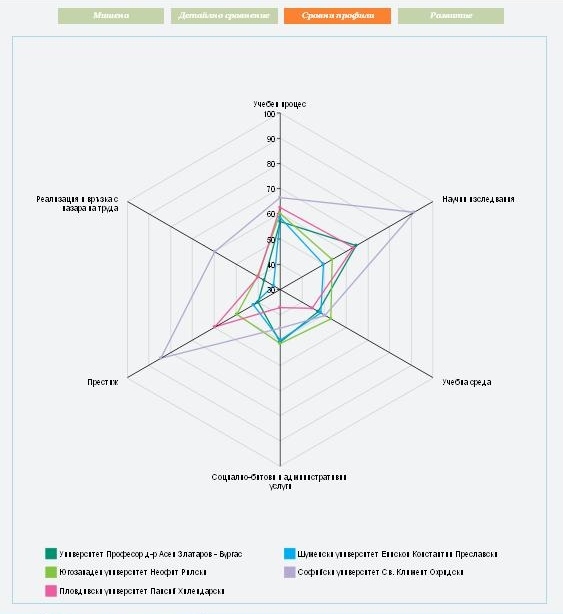 According to the ranking system of the universities in Bulgaria, the level of research is an important criterion for the ranking (https://www.uni-sofia.bg/var/ezwebin_site/storage/images/media/images/ch...). Sofia University is the leader in “Informatics and Computer Sciences”. The Ruse University and Shumen University are with very high indicators in the mentioned thematic field. The Technical University-Sofia is a leader in the thematic field of “Computer and Communication Engineering”, and Ruse University, Shumen University and Burgas University follow the rank list with very high indicators. The Training is conducted at undergraduate (Bachelor and Master) and postgraduate programs with very high accreditation assessments by National Evaluation and Accreditation Agency. As university centres, the five partners are providing training and research in many scientific fields, having capacity for research in the scientific field Computer Science related to the ISSS priority axis “Informatics and ICT”. This is evident from the fact that for the period 2011-2016 the five partner universities have in Scopus total of 901 publications in the area of Computer Science. In the Web of Science for the same period they have 495 publications in the field Computer Science and 85 in field Telecommunications.